Tánaiste Eamon Gilmore was speaking on Sky News this morning about the ongoing debate within the UK with regards to their membership of the EU. 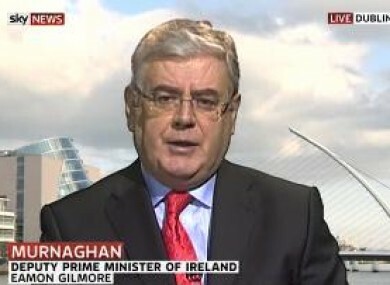 Tánaiste Eamon Gilmore on Sky News this morning. TANAISTE EAMON GILMORE has said that Britain would be “rocking the boat” if they were to withdraw from the EU. Speaking on Sky News this morning, Gilmore said that that all the states in the EU must concentrate “on the priorities” which he said were the “economic situation and the employment crisis”. Emphasising the Europe-wide issue, he said that students were graduating from colleges in “Liverpool, Lille and Limerick” and had no jobs to go do. He said that the entire leadership of the EU needed to be concentrated on this. Gilmore said that Ireland has “”walked hand in hand” with the UK since joining the EEC and that it was important that this continued. You have to look at how modern economy is organised. We are dependant on each other. While saying that the EU allowed for countries to enjoy certain “flexibilities” such as Britain’s non-membership of the Euro, he said that there could not be flexibility on the “core issues”. While we respect that this [Britain's decision regarding membership of the EU] is very much a British matter, we have an interest in it. At this critical time, we need to concentrate on the things that Europe needs to do. Email “British withdrawal from the EU would be 'rocking the boat' - Gilmore”. Feedback on “British withdrawal from the EU would be 'rocking the boat' - Gilmore”.